One day recently, when I was out and about on the farm with camera in hand, I happened by the paddock “condo” where Bear and his new girlfriend, Galla, were canoodling. I love to see my beautiful boy so content. Life unfolds, yes it does. I haven’t written much lately as there’s just been so much to integrate. Often when we’re in the middle of a shift there’s just no point in writing about it. We need to experience it without the burden of recording it. I often have dreams where I see an incredible vista and and reach for my camera so I can capture it, but my camera doesn’t work. I’ve taken this to mean that sometimes life just needs to be savoured, in the moment, and that’s just how I’m kind of looking at things right now. For no matter how I plan ~ to take a vacation or whatever ~ nothing seems to be falling into place. The shutter won’t work. So, I observe the unfolding of life. With Bear all I can do is my best to keep him comfortable and happy. Fortunately, as I’ve noted before, he is a sensible soul and is taking his confinement, due to a suspensory ligament injury, remarkably well. In fact, Wendy made the comment the other day that he’s the best rehab horse, in terms of his behaviour, that she’s ever come across ~ and she’s known and cared for many. So, I have this for which to be grateful. Bear is doing his bit to get well again. Still, the end result is uncertain and a long way away. He had his two-month ultrasound check-up last Friday. 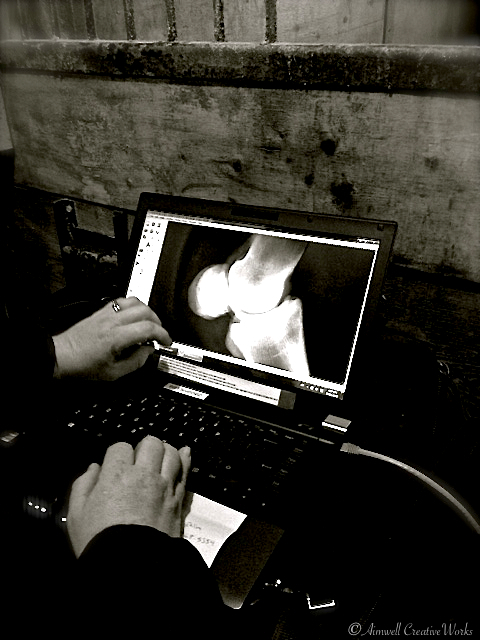 This was an opportunity for Dr. Maggie to see how well the injury is healing. The good news is that the lateral suspensory desmitis is looking better than it was two months ago. The lesions in the affected tissue are reducing in size and the prognosis seems favourable for a reasonably full recovery. I qualify that to mirror the words the good doc shared with me in conjunction with this ~ because of Bear’s already dropped suspensory ligaments in both hind legs it is unlikely he’ll ever be back in full work again, i.e. no more dressage training. 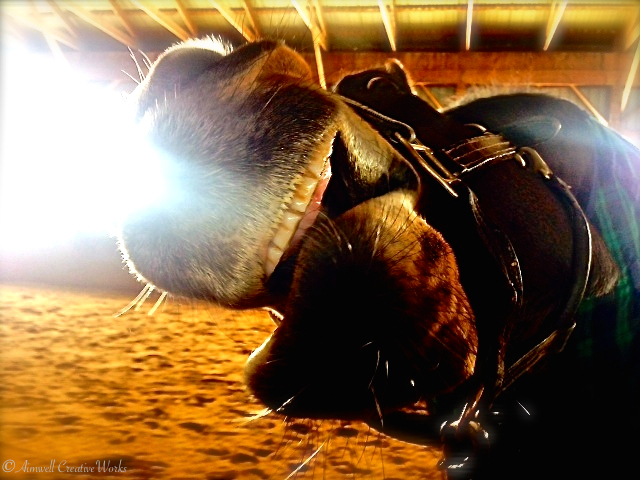 He’ll be a lovely hack horse ~ one with whom I can do some light work and go for rides on the trails ~ but that’s about it. If I hadn’t been through the last two months of hand walking and meditating and soul searching with Bear this might have been difficult news to take. But the fact is, I more or less came to the conclusion some time ago that Bear’s destiny is to be numero uno in my emerging therapy herd. When I consider the sensitive soul he is and the stress he endured as I was managing both menopause and adrenal fatigue in those years when we should have been focusing on his training; and I consider the anxiety and panic and fear (mine and others’) he was exposed to and which coloured everything we did, and what a good boy he was under those circumstances, I feel he’s done enough. At this age and stage of his life it would be unfair of me to burden him with my dressage dream. Besides, his beautiful body is not designed to be the dressage horse I have in mind ~ he’s weak where he needs to be strong, and I don’t want to exacerbate his physiological problems by pushing him into work for which he is obviously not suited. So, my kind-hearted, sensitive and funny boy is destined for life as a healer and that’s okay by me … and him, as it happens. He loves to make people happy. In the meantime, we focus on healing this injury as best we can and continue to deepen our connection as we move forward toward the next chapter of our lives together. 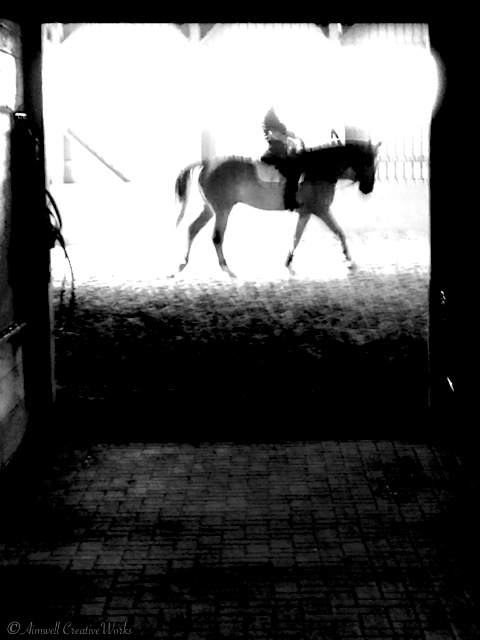 Having said all that, my dressage dreams still live. I may be in my early 50s, and I may be experiencing the dreaded gravitational slide into old(er) age, but riding is still important to me, and as long as there is air to breathe and I have a pulse, I’m going to ride. And not just riding for the sake of it ~ I want to challenge myself to a higher level of performance. I’ve never been in a position to really test myself with the support of good people around me who understand and care about my dreams. Now is my time. 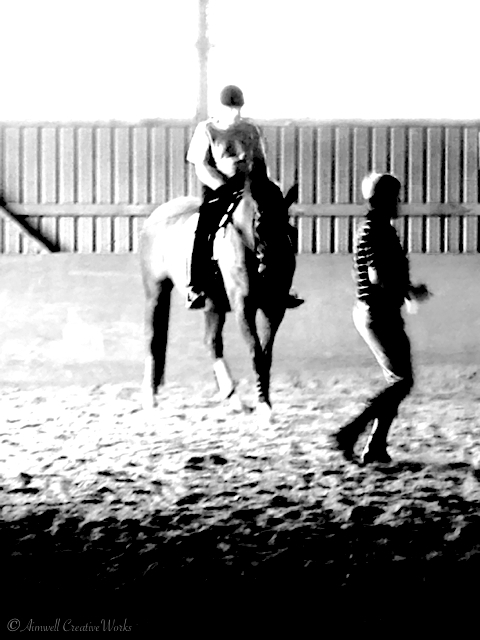 As I mentioned to Wendy the other day, it’s time for me to find out what I’m really made of as a rider. I have the coach and a good support system around me. Is it possible to draw from a life time of accumulated riding experience and skill the horsewoman I’ve always dreamed of being? Still, I’m not rushing into anything. Bear is my first priority, and he knows what’s up because I’ve told him. 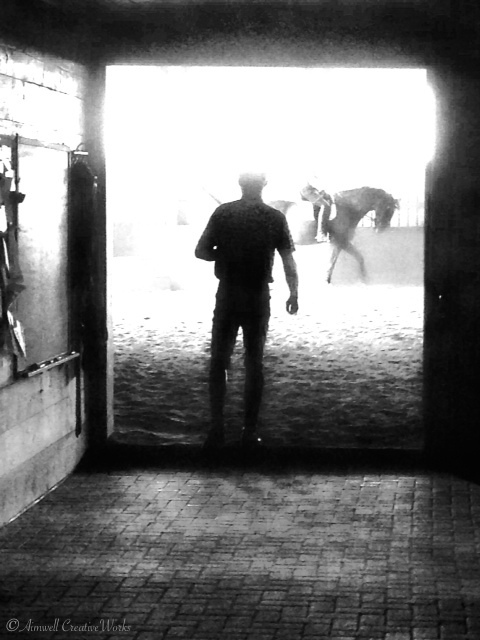 And I dare say, given his relaxed and happy attitude while he’s healing, he has no problem handing over the reins to another horse who really enjoys the work and is more physically capable to do the kind of dressage training I have set my heart on. Bear continues to set the example for me of patience, and while it is difficult to see the end from the beginning sometimes, I have faith that life will unfold as it should and we will enjoy the next stage of our journey together in an even more meaningful way. And on that note I doubt I need to remind you to … nurture what you love. 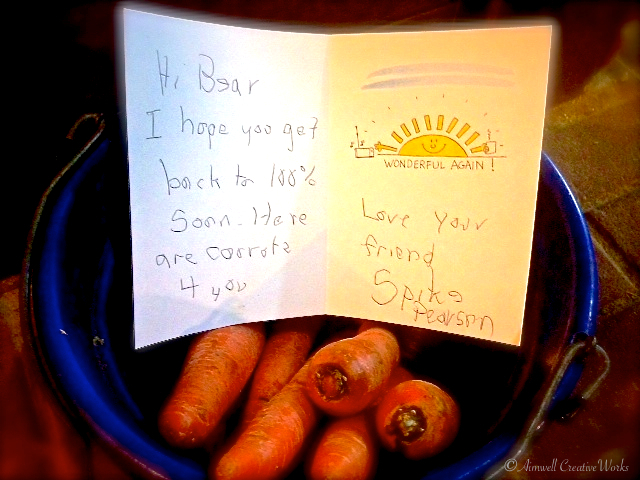 This week, a special declaration of friendship from his buddy, Spike Pearson. Bear is such a lucky boy to have such good friends. 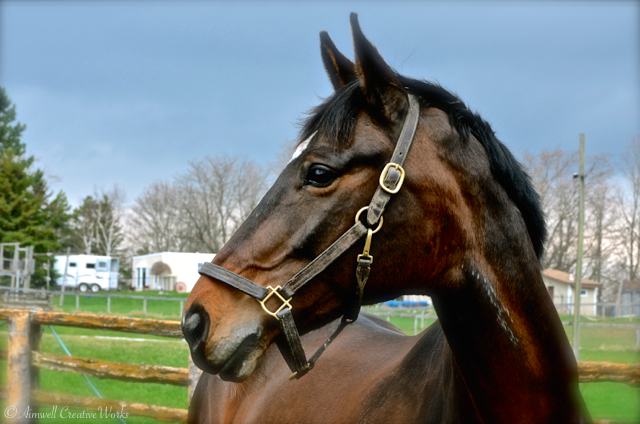 A little over two weeks have passed since Bear’s injured suspensory diagnosis and things seem to be progressing well. Thankfully, my emotional roller coaster has levelled out as I’ve become more accepting of this unexpected turn of events. I’ve also gained a better understanding of shock. One thing I’ve learned from this experience is that we should never underestimate the impact of shock, no matter how minor we consider it to be. Shock disorients and unbalances us in all kinds of insidious ways, impairs thought processes and wears us down. Allowing the dust to settle during a time of personal crisis is crucial before we make important decisions if we’re to live without regret. 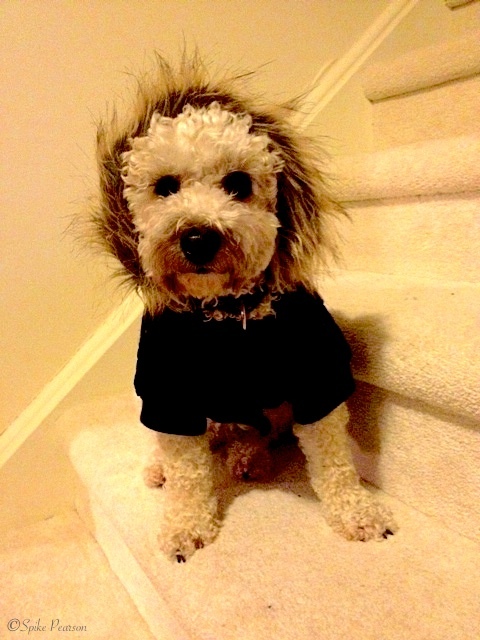 Of course, Bear doesn’t really make decisions … he simply goes with the flow ~ something I can still afford to do better. He’s has managed to settle into the new routine without all the drama. He is perfectly content, while in his confinement, to amuse, and be amused ~ eating, sleeping, engaging in Jim Carrey-like facial contortions. He’s accepted his lot ~ a reminder for me to do the same ~ to go with the ebb and flow of life and be with what is; to respond to events appropriately as they happen and then, as the proverbial contented horse, go back to grazing. It’s a challenging lesson, to be sure, but here’s Bear, in his wisdom, showing me the way. I always knew he was more than just another handsome face. For me, as always, personal awareness is key. While I struggle with old issues triggered by the shock of Bear’s injury I realize that to face them head on and deal with them mindfully is the best possible course of action. In an odd kind of way, Bear’s convalescence is giving me yet another opportunity to heal some old emotional wounds and, as an added bonus, get appropriate rest as well. Healing, emotional or otherwise, takes energy and can be tiring. So, we need rest. So, that’s the scheme of things for now. I don’t have another horse to ride at the moment, so my option is forced R&R with Bear. There’s no point in bemoaning something that cannot be changed. Life happens and, as my dear boy keeps reminding me, it’s best just to get on with it as best you can … and smile. Naturally, we’ve developed a new routine and it appears to be working well. 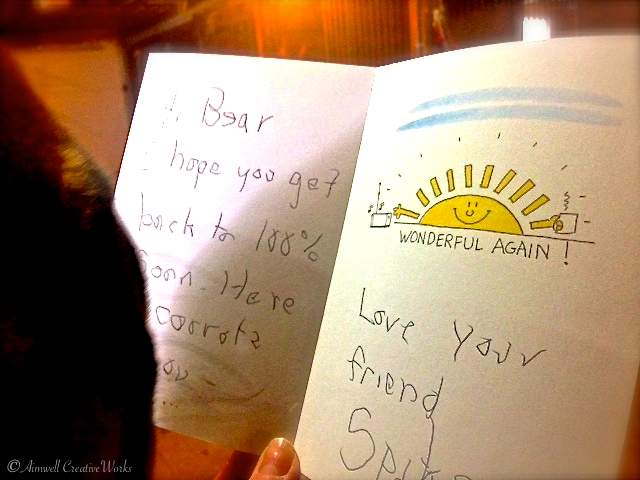 In the mornings before I arrive, Bear helps ~ a loose interpretation to be sure ~with the chores. He gets rotated between stalls (for a change of scenery) while the barn is being cleaned and, being the enterprising equine he is Bear finds all kinds of opportunities to make himself useful. Cleaning up residual grain in his buddies’ feed tubs and scarfing remnant hay are his first priority. He hates wastage. 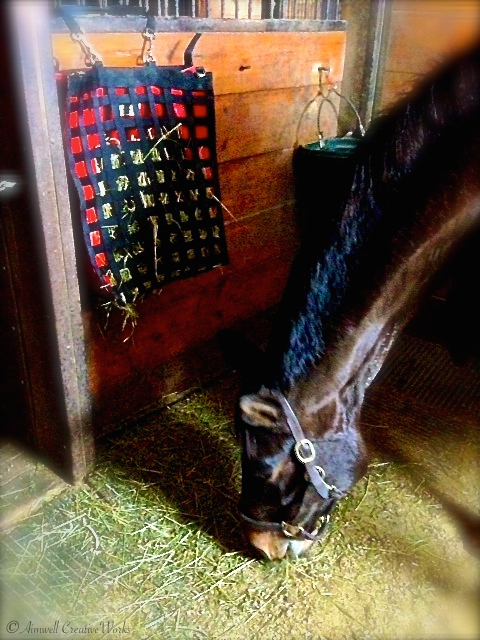 By 11 a.m. or so, his arduous tasks complete, Bear’s back in the comfort of his own freshly cleaned stall, indulging in a generous helping of hay plunged into the depths of the nibble net he’s borrowing from his generous buddy, Midas. 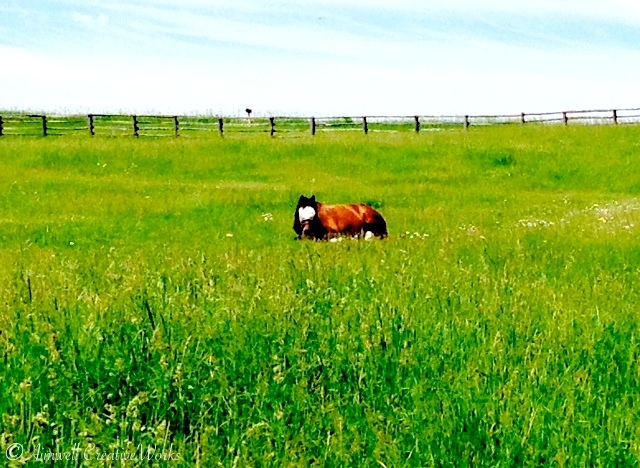 By the time I arrive (around noon) Bear’s almost finished his morning hay ration or is lost in a mid-day snooze. We say our hellos and then head into the arena for a little hand walking which, as I’ve discovered, can be considered more entertainment than exercise. Sure, he gets to stretch his legs, but more importantly he can gaze admiringly at his reflection in the mirror, or play follow the leader, or hunt for carrots in my pocket. The possibilities are endless. Eventually, when the weather warms up and the ice melts, we’ll be able to go outside for a toodle, but for now these moments of mirth and perambulation indoors must be our lot. 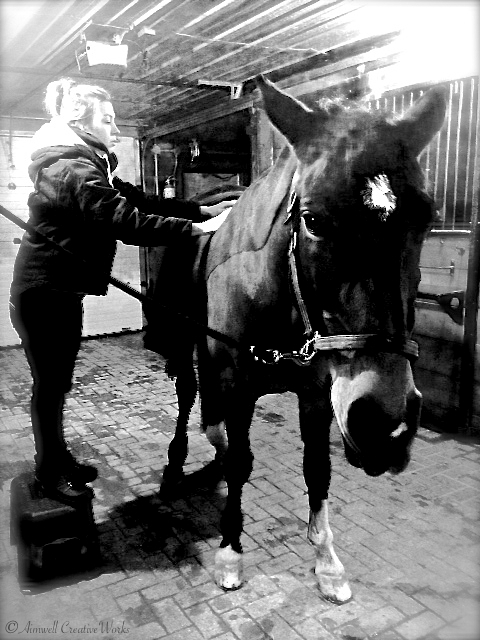 After 10-15 minutes of freezing our butts off, we head back to the barn for his daily grooming ritual, complete with more carrots and the occasional wintergreen mint. He likes those. 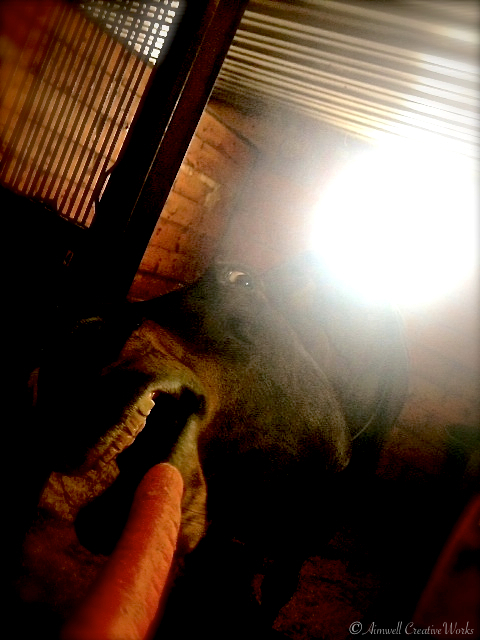 As well, his bandages are changed, his hay net refilled, his stall picked clean, his water topped up and, oh yes, a heaping handful of yummy orange root vegetables are left in his feed bin. Who wouldn’t like a fancy new pair of shoes and a massage to brighten up a cold winter’s day? Monday was not my day for a pedicure and a back rub. It was Bear’s. As luck would have it his appointments with the farrier and REMT just happened to fall on the same day. 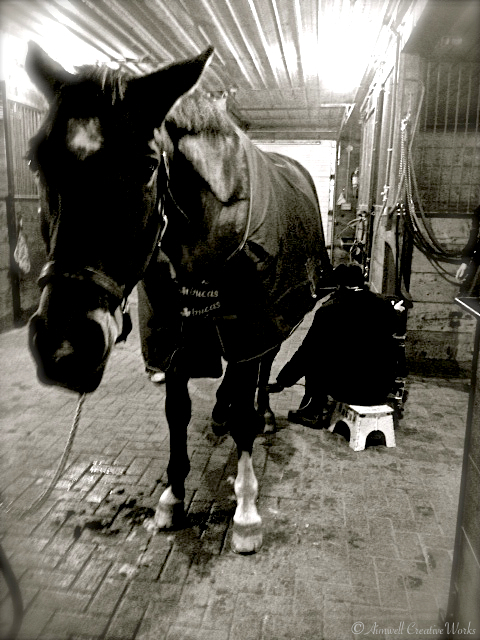 Proper hoof care is important, and perhaps even more when a leg injury is involved. 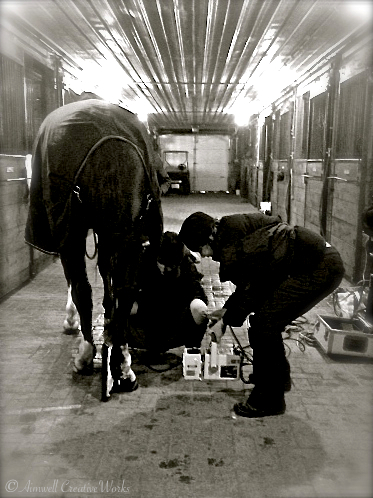 Even though Bear’s right hind suspensory is bandaged 24/7 for the duration of his 120-day confinement, it requires extra support to aid healing. The egg-bar shoe, which Dr. Maggie, Bear’s attending vet from McKee Pownall Veterinary Services prescribed as part of his treatment, is designed specifically for this purpose. As the name might suggest, this shoe is egg-shaped. It fits onto the hoof like any other shoe, however part of it juts out behind to help take pressure off injured suspensory ligaments. Oh, well. At least Bear now has the shoes for the journey. About an hour after his pedicure Bear was happily in massage mode. Floppy-eared, soft-eyed, and as zoned into this gentle muscle manipulation as anyone could be. Maybe I need to book one of these for myself … hmmmm. 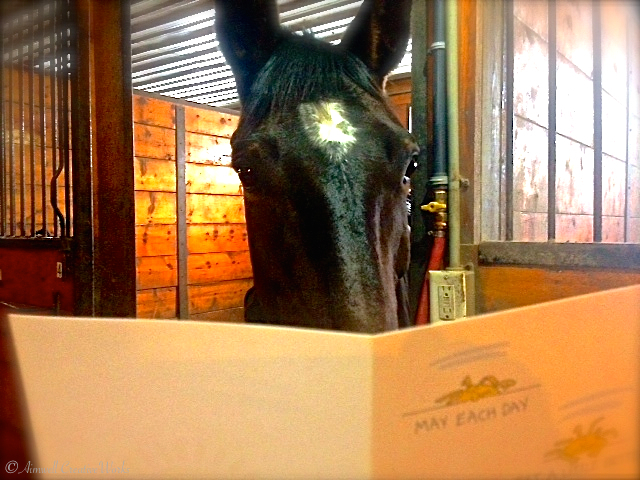 So, what about a little pampering for this Horse Mom? Yes, indeed. What about it? Between the six-month Facilitated Equine Experiential Learning certification program in which I participated the last half of 2014 (an amazing learning and healing experience) and this proverbial blow to the solar plexus things have been pretty intense of late. A change of scenery is definitely in order. Figuring out what that is, where it’s going to be and organizing it is another matter. My biggest challenge is that living with adrenal fatigue for the past three years has, out of necessity, made my world quite small. My life has been at home and at the barn, with the occasional accompanied trip abroad which I always had to manage carefully. This experience provided me with great insight on recovery time and maintaining a low profile while the body does what it needs to heal. Still, now that I’m feeling more robust I want to expand my comfort zone again. Just how to do this without overwhelming my still recovering nervous system is the pressing question. I expect I’ll be asking similar questions once Bear starts into work again in a few months. How much can I push him without risking re-injury to that suspensory? See … we are not so different. It’s all about mindfulness, of course, and being open. As I’ve said before, things invariably unfold as they should and it’s been my experience that going with the flow is always a good practice. Doesn’t mean it’s easy, but it does work. Just ask Bear, my going-with-the-flow guru. A few months ago I began the journey of a life time. No, it wasn’t to some foreign land out there. It was to an exotic place of mystery and richness residing in me. During my passage I’ve kept a pretty low profile on this blog. It wasn’t because I had nothing to say; nothing to share. It was simply, in my mind, inappropriate to turn this into a travel log of my adventures on this intense journey; a journey ripe with personal revelation. 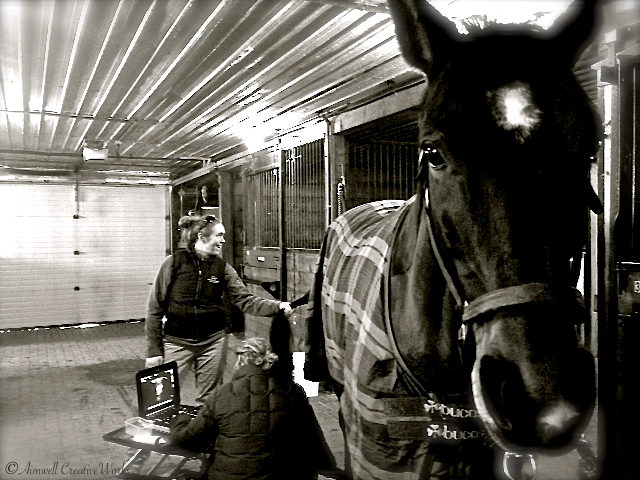 Processing and integrating the facilitated equine experiential learning material was not just about absorbing the content I plan to facilitate as a practitioner of this incredible healing modality. Rather, it was also another huge step along the path to my own healing. Every new port of knowledge provided an opportunity for me to check in with where I am in my life. Profound moments of self-discovery; “A-ha!” moments around every corner delighted and despaired and delighted again. The healing heart energy of these magnificent creatures who, by their very being, can’t help but be enormous catalysts for personal awareness and change if we but open our hearts to this truth, shone a light on my own magnificence and gave me a chance to see more deeply into my truth. Learning about fields of energy and connection, heart resonance, body language, the messages and power of emotions, and witnessing the healing changes in the lives of those with whom I shared this journey ~ six beautifully spirited women all with a love for the horse and a desire to make a positive difference in the lives of others, horse and human alike ~ has given me a new respect for the power of this work. All of us stepped into a knowledge of Self that, I dare say, might have been impossible under any other circumstance. 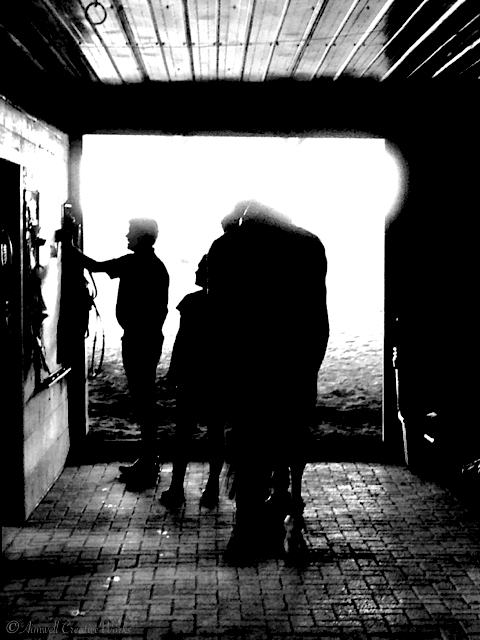 The horses, being non-judgmental, and the sacred space of learning and trust created throughout the three sessions, gave all of us a safe place to explore our inner worlds and integrate the powerful lessons our incredible equine teachers had to share. Cleansing tears; tears of laughter and joy; moments of frustration when a particularly hard lesson presented itself; moments of triumph when the key to an emotional prison finally unlocked and the door swung open to a sense of personal liberation not felt before. Discovering true Self; true personal power and learning how to live in a more authentic and healing way in the world changed us. Changed me. 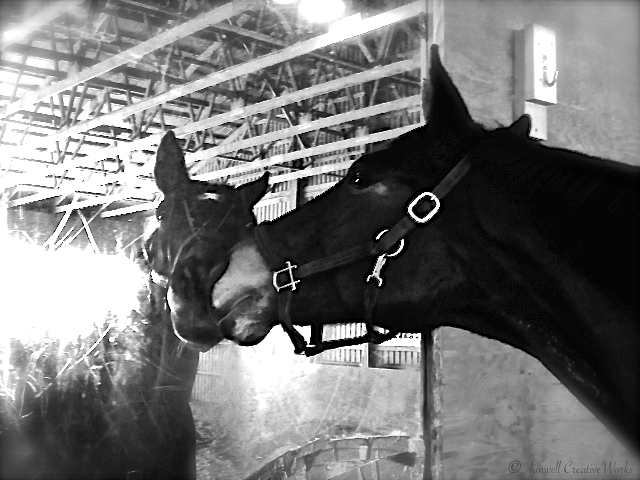 And through all of this, my relationship with Bear ~ my equine companion of the past nearly nine years ~ grew deeper and more connected. I honour the sentient being and powerful teacher of awareness that he is. Together we have grown; matured; healed. Time in the saddle for us is now more an exercise in synergy than frustration. Supported by our incredible teachers and mentors we have a glimpse of our potential ~ something which a year ago seemed unimaginable. Who I am today is not who I was on June 26, 2014, when I started this journey and boarded the inbound flight. My heart is softer. My mind is more open. My health has improved. My ability to take life as it comes has blossomed. I am getting better at accepting the process of life. I am kinder to myself. This doesn’t mean I don’t have moments of frustration, et al, but I am able to pass through them more quickly and come out the other side feeling more optimistic and grounded. Bad days; hours; minutes happen. Learning how not to dwell on these times has been a major lesson indeed. 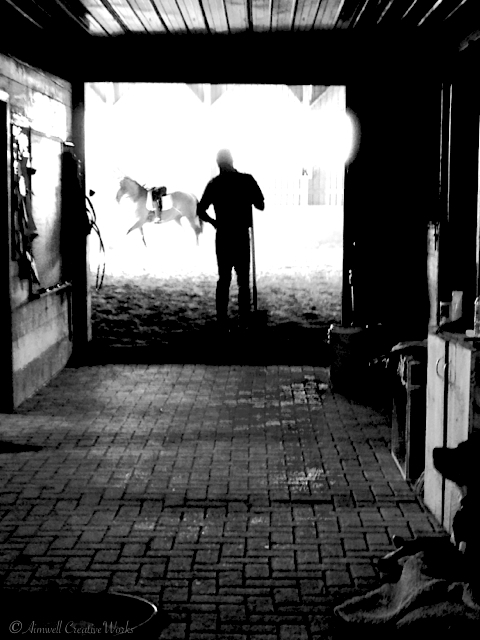 Having the support of my therapist, my mentor and the horses has made all the difference in the world. 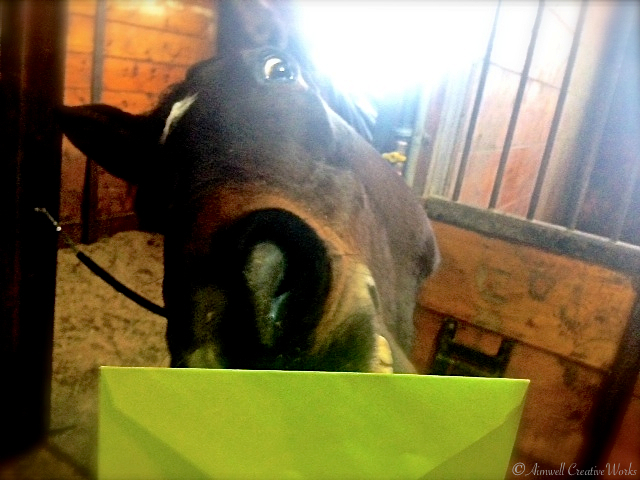 Equine experiential learning has changed my life, and I am excited to see, now, what the future holds. That remains to be seen. I have a vision for this work that requires a farm, a suitable herd of horses and kindred human spirits. We shall see how, and when, that materializes. In the meantime, I continue to practice with Bear and increase and improve my knowledge. As well, I have started a new blog/website dedicated to my experience of this work. 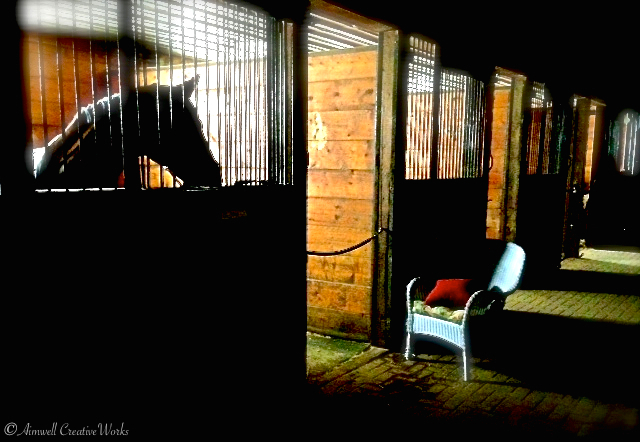 Somewhere I can explore themes and share what I, and others in the world of equine experiential learning, have gleaned. It is, like me, a work in progress. 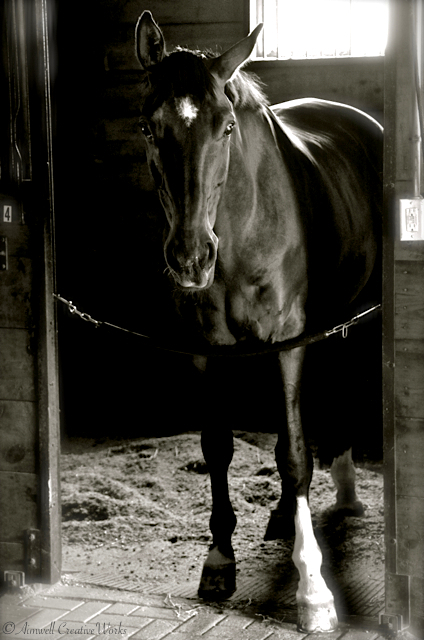 Cor Equus is Latin for “heart of the horse.” I have combined the two words and given my practice the name CorEquus. 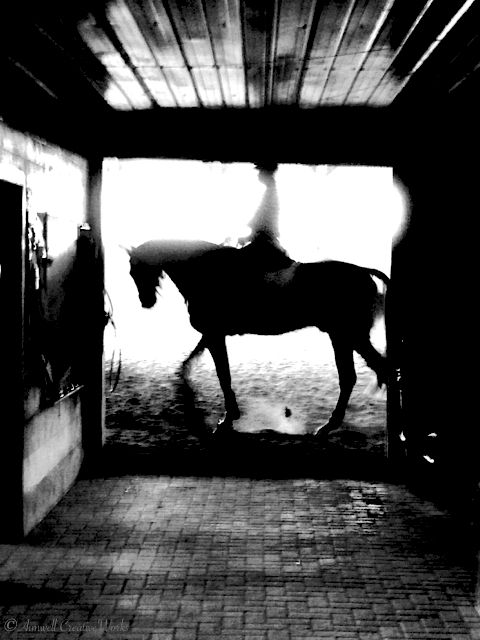 From the heart of the horse emerges the reflection of who we are. By way of the horse we can find our truth and begin to heal. Here is the link to CorEquus. 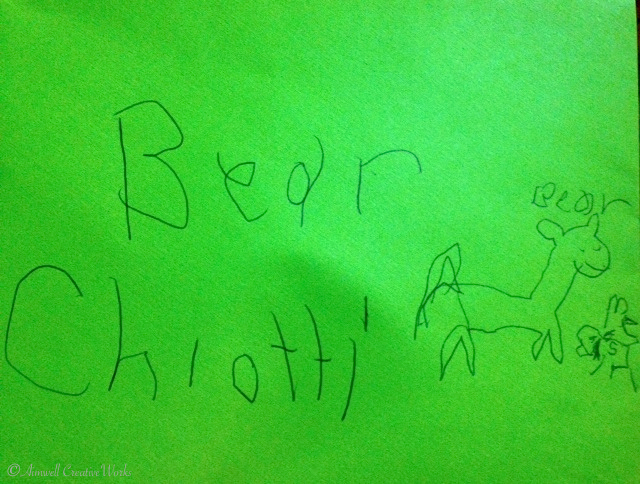 Musings of a Horse Mom, on the other hand, will return to being Bear-centric ~ a more light-hearted look at horse-worldly things. Who knows where the road will lead. As I announced to my mentors and the group on December 2, graduation day, my heart and mind are open; my faith in myself restored. Basically, the sky’s the limit. Is not for faint of heart consumed with fear. For new and wondrous blessings to appear. Where I didst gladly test myself and jump. Til I no longer could my spirit hide. My heart no longer faint thus soundly slept. 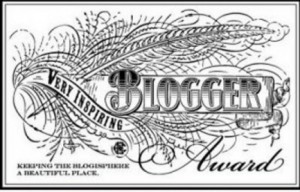 My considerable thanks to those of you who follow this blog and who have, during the past few months, offered words of support and encouragement. It means the world. May the world be yours. The last session of the Facilitated Equine Experiential Learning (FEEL) certification program is next weekend so life is somewhat hectic right now. 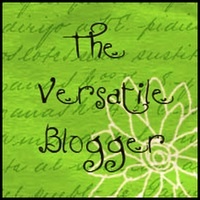 Assignments to complete (including a new blog/website dedicated to the work … stay tuned! ), Bear to organize for my six-day absence and, of course, gearing up for Christmas (which, for obvious reasons, is taking a back seat right now). His spirits are as good as ever, and why not? It’s been a regular spa fortnight for my four-legged fuzzy boy. Then the massage therapist to fix the supporting structure. 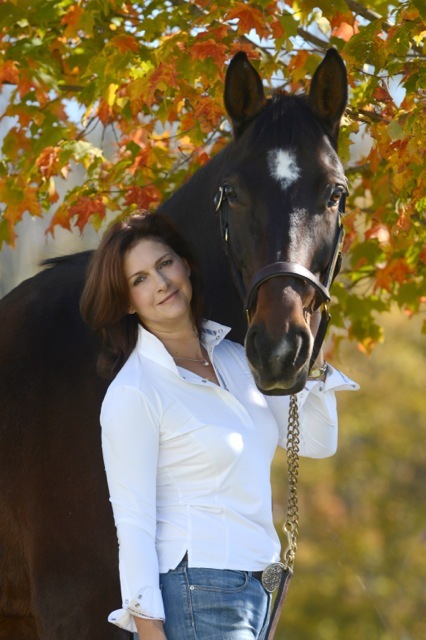 She prescribed a heating pad over his loins and hips before each ride to help warm up those muscles and get them to relax. Bear is now moving better than ever! Then on Sunday, a visit from the stylist (used in the loosest possible way) to give him his annual winter clip. For me, in recent months, the FEEL course has been that something different … and it has changed my life for the better in ways previously unimaginable to me. It has also deepened my relationship with Bear in amazing ways and given me an opportunity to see him in a brand new light. Not just as a companion in recreation and sport; and not even as a valuable life teacher (which he is), but as an incredible healer of the heart. It is a beautiful thing. It’s been just two months since I embarked on my Facilitated Equine Experiential Learning (FEEL) journey, and the rate at which new information and change is flowing in, through and around me is nothing less than astonishing. So much growth in just eight weeks and on so many levels it’s put me into heavy duty integration/processing mode. However, this makes writing about it a challenge. Even though the information I’m learning resonates with me at a deep level, the facts and feelings are still finding their way home. 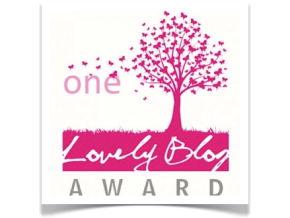 I’m looking forward to the day when the words just trip from my finger tips onto the keyboard and into my blog posts, because for now it is an arduous task at best. Clarity is important when sharing this incredible work. I want to do it well. Having said that, I’ve written a short piece of fiction in three parts inspired by a prompt and a few supportive blog followers, that touches on one of my experiences from the first FEEL session in July. Here’s the link to the beginning: Lost and Found … Part I in case you’re interested in reading it. Parts II and III appear in consecutive posts. The setting and characters are fictitious, of course, but the work is not. My experience doing Reflective Round Pen work at that first session turned into an incredible life altering moment for me. I was not planning on putting it into any written form, at least not yet. But then the prompt came and sometimes you just can’t plan for these things. I like the way the story turned out. I hope you do too. Of course, behind every experiential learning activity is a wealth of research and background information to support it. I’ve spent a good deal of time reading from a number of books and resources that help to bring the work to life. Institute of HeartMath ~ is an “internationally recognized nonprofit research and education organization dedicated to helping people reduce stress, self-regulate emotions and build energy and resilience for healthy, happy lives. HeartMath tools, technology and training teach people to rely on the intelligence of their hearts in concert with their minds at home, school, work and play.” I’ve really enjoyed learning about this and plan to become really conversant in it. 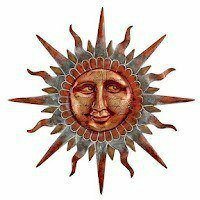 Institute of Noetic Sciences ~ founded in 1973 by Apollo 14 astronaut, Edgar Mitchell ~ “a 501(c)(3) nonprofit research, education, and membership organization whose mission is supporting individual and collective transformation through consciousness research, educational outreach, and engaging a global learning community in the realization of our human potential. “Noetic” comes from the Greek word nous, which means “intuitive mind” or “inner knowing.” IONS™ conducts, sponsors, and collaborates on leading-edge research into the potentials and powers of consciousness, exploring phenomena that do not necessarily fit conventional scientific models while maintaining a commitment to scientific rigour. … The Institute’s primary program areas are consciousness and healing, extended human capacities, and emerging world views.” I’m just learning about this. It’s fascinating. In An Unspoken Voice: How the Body Releases Trauma and Restores Goodness … by Peter A. Levine PhD ~ this has been an incredible source of understanding for me with respect to how early childhood and developmental trauma has shaped my life, and provided greater awareness concerning how trauma may be managed and released. Many lightbulb moments here. And lots of processing. 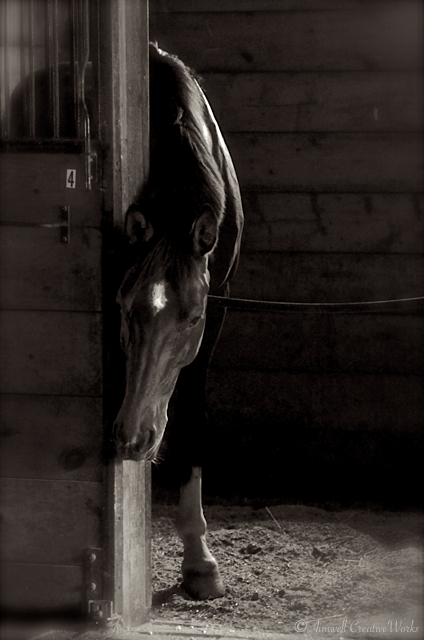 The Way of the Horse … by Linda Kohanov ~ I reflect on a chapter a week, depending on which of the cards call my attention. It’s amazing how the information I read reflects so accurately the place I am in my life in that moment. A great learning tool and beautifully presented. Reading and connecting to the information presented in these resources alone (and I’m just barely scratching the surface here … there is so much more) has been heart and mind opening to say the least. My understanding and experience of life, and my Self in it, has deepened dramatically. The amazing thing about this work is that as I learn I also heal. It’s so profound. I’m finally integrating the idea that my past is not my future. Emotions are information, not prison guards. Allowing them to speak; listening to what they have to say is the beginning of healing and letting go. When we are stuck in our emotions we are stuck in the past; stuck in our lives. Debilitated. From my own experience I know this is not a nice place to be. Of course, learning to treat emotions as information takes time and practice. From what I’ve experienced so far, it’s worth it. For instance, the incident with the dressage boot was extremely painful on a physical level, and frustrating in other ways. However, as soon as I started listening to and considering the deeper body-held message of trauma real healing ~ physical and emotional ~ was able to begin. Lifelong trauma held in my hips finally released. In fact, my hips have never felt better. What I realized was that looking at the issue as more than just physical; being willing to recognize the emotions that sat in the background waiting to be acknowledged and released was an important part of the healing process. It IS an important part of the healing process. All of this simply confirms for me that unless we are open to the lessons life has to teach us in the moment, they will be repeated until we finally make the connection and do the work to heal. Meanwhile, Bear’s in recuperative mode. In my last post I mentioned some concern about a possible issue with his left stifle. Flexion tests showed that Bear’s issue was acute rather than chronic, though we do need to keep an eye on a couple of things. He’s been put on a joint supplement that will help and he’s been only in light work of late. Today he had a chiropractic adjustment ~ his first in almost a year ~ and this should make a big difference. He certainly enjoyed it. The thing I’ve realized is that he’s processing, too. Like me, Bear has absorbed a lot of new information this year. His body is being asked to work in a new, more correct manner, and the old ways must be released. This is bound to cause some strain. Like breaking in a new pair of shoes there’s bound to be some discomfort for a while until they’ve moulded to your feet. Bear’s body is moulding to a new, more aligned way of being and it’s taking some toll right now. With patience and lots of pampering he’ll be his new self in no time. I’m excited for the possibilities that lay ahead for Bear and me, but am in no hurry. Everything has a process that must be respected or we just buy ourselves more unnecessary misery. By my observation the only thing that’s ever in a hurry is the ego. Interestingly, while Bear’s been off I’ve had the opportunity to ride another horse. My first time out with Harry was disorienting, to say the least. He and Bear are so different. However, as we got to know one another and our relationship progressed both on the ground and in the saddle we found an understanding. Like any new relationship I had to find my place in his world. Had to release any expectation and embrace the new experience. Riding Harry the same way I rode Bear was not going to work. I needed to adapt to Harry’s needs; learn the language he understood before piling on any new information that was intended to make his working life a little easier. Slowly building a synergy with Harry was my primary goal ~ first at walk and then trot and then, when completely comfortable, the canter. 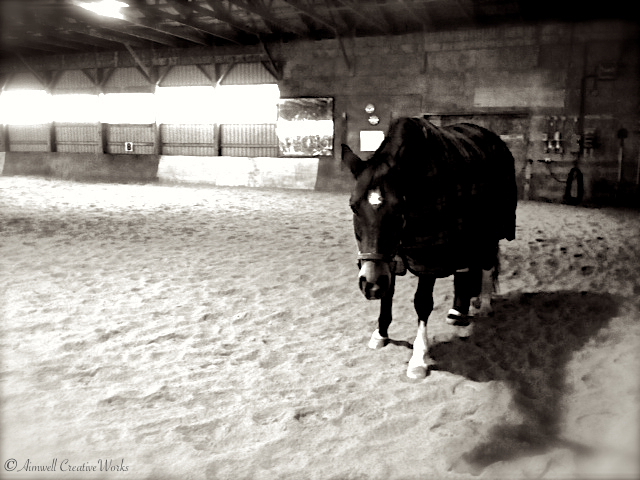 My intention whenever trying a different horse is to feel what they need, not demand from them what my ego wants. Proving myself is not the point. Creating a good working relationship with a horse that has allowed me to take up residence on his back for half an hour is the goal. It’s better for both of us. I’m pleased to say my approach has worked well. Together Harry and I have grown, and what I have learned from Harry I am adapting to Bear. It makes a difference. But that’s what moving beyond our comfort zone does, isn’t it? It gives us another perspective that we can integrate into other areas of our lives. Sure, anytime we move beyond what we consider to be normal there is a period of disorientation. How we move through that momentary feeling of imbalance and confusion depends largely on how aware we are in the process and how open we are to change. Harry has proven another wonderful catalyst for change for me. He has tested my skill and expanded my comfort zone in a way I was not anticipating. That said, I appreciate any horse ~ any person~ who, without agenda or judgment, is able to help me find a missing piece of my Self. When Harry met Dorothy her life changed … again. Bear and I are really fortunate to be working with a coach of the German school. I call him the Master because he is just that ~ a Master horseman. 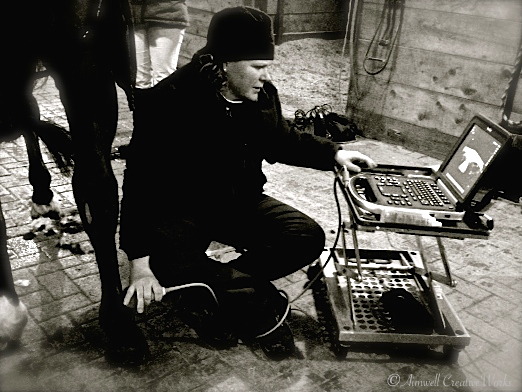 As the Master, he is most invested in the development of both horse and rider and is, as a result, thoroughly engaged in the process of training. This is great for us, his students, because it spurs us on to engage our best energy as well. The Master has claimed the blackboard outside the arena door and this is where we congregate for lesson scheduling. I featured this image on my photography blog Eyes to Heart recently. If you’re interested, link through to this post to read more about my experience with this incredible teacher. 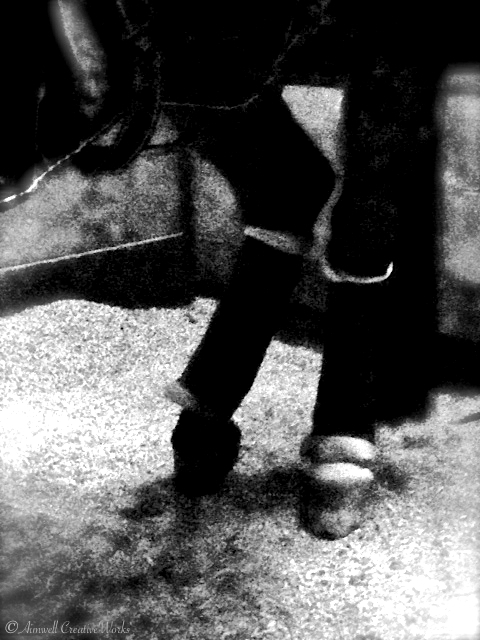 On the ground the Master demonstrates, in his own special way, the nuances of the perfected ride. The Master is always on the move ~ whether he’s running beside a student as they execute a particular movement, standing in the middle of a 10m circle shouting encouragement or leaning on a shovel between shifts of scraping footing back into the track, he’s a going concern. And yet he misses nothing. 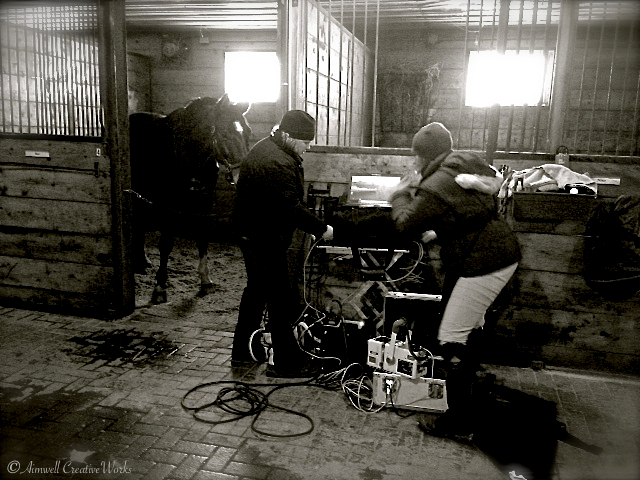 Being able to teach the student effectively means having a thorough understanding of the horse. Occasionally the Master will ride his student’s horses, including Bear, to get a clearer understanding of how the horse is working so he knows what the student is up against. Since the dressage boot incident the Master has ridden Bear several times and taken the opportunity to sharpen him up for me. The difference is amazing! 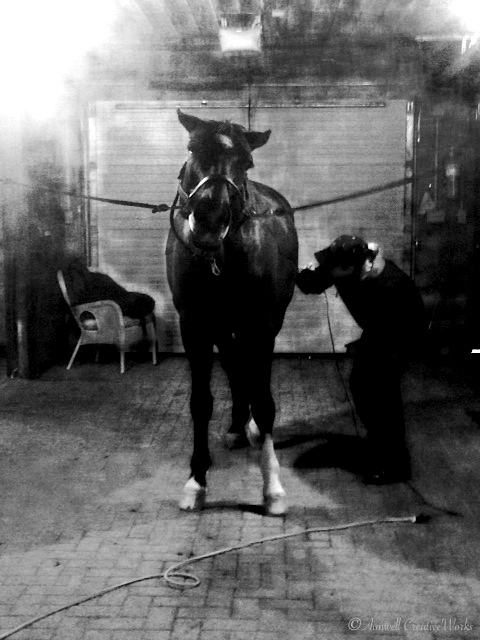 What I’ve I learned from this is that it’s not necessary to carry the burden of training my horse all on my own. The Master knows a lot more than me and I’m happy for him to share his wealth of knowledge and skill to help bring out the best in Bear … and me. Bear is working more correctly and is happier too. 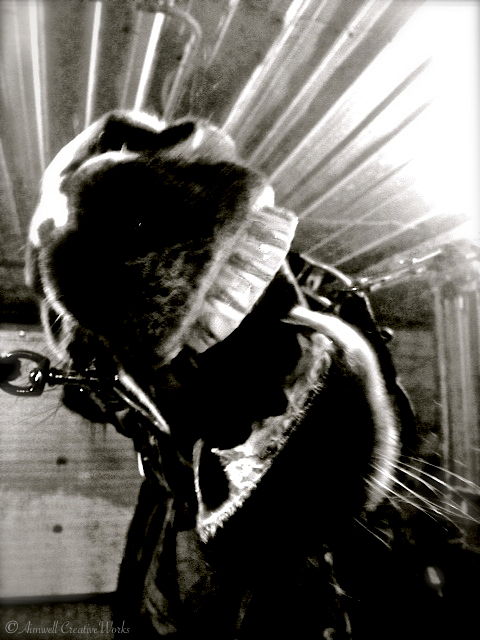 When all is said and done it’s about developing a healthy relationship with the horse by employing key principles of horsemanship and adopting correct techniques. I have learned so much in the past several weeks simply through observing the Master. Whenever I ride I do my best to emulate his very correct position and use of the aids. And we have the Master to thank for that. PS More on my experiences with the FEEL certification program coming up!